Annalee Doll Description: Open eyes, white body, peeking out of red and green snowflake print mitten. Facial expression may vary. Annalee Doll Description: Open eyes, mouth expression may vary, blonde hair, red hat with red/green/white stripe trim, red body with white fur trim, green elf-type boots with pom, red/green/white stripe cuffs. Companion is 866306 - Green Candystripe Elf Ornament. Annalee Doll Description: Open eyes, mouth expression may vary, blonde hair, green hat with red/green/white stripe trim, green body with white fur trim, red elf-type boots with pom, red/green/white stripe cuffs. Companion is 866206 - Red Candystripe Elf Ornament. Annalee Doll Description: Last one. Open eyes, closed mouth smile - as shown, tan body, red/green/white stripe chef hat, red oven mitt, white apron, gingerbread man cookie in hand and apron, green base. Annalee Doll Description: Open eyes, open mouth, tan body accented with white frosting, white hair, red and green vest, holds candy cane. Annalee Doll Description: Open eyes - as shown, beige face, ears and feet, ivory fur, red Santa hat, bell around neck. Annalee Doll Description: Open eyes, white hair and beard, red cloak and hat with brown fur trim, green gloves, tan satchel, black boots, holds lantern, tan base. Mouth expression may vary. Looks fantastic as a street person with the Dickens Series and the 2007 Caroller Family, items 763307, 763407 and 763507. Annalee Doll Description: Open eyes, open mouth, tan body, red/white/green stripe chef hat, red oven mitt, white apron, gingerbread men cookies in hand and apron, green base. Companion is 866506 - 5" Gingerbread Chef. Annalee Doll Description: Open eyes, mouth expression may vary, white body and hair, red hat, green scarf, holds wreath. Squinting available, please request in notes section when ordering. Companions are 774505 and 774606. Annalee Doll Description: Wanted to Buy. Do not let this rare opportunity to acquire this huge life size Santa pass you by. Perfect piece to stand next to your Christmas tree, fireplace or foyer. Box size is 64" x 29" x 19". The white pole with a 3' x 3' base is inserted up the back of the Santa for support. He does not bend at the waist. 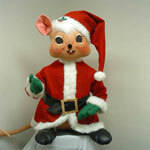 Companion is 969607, the 4 Foot Santa Mouse. The perfect family heirloom. All orders will be shipped via Fed-Ex. Doll will ship in its own box and must be ordered separately.